I recently had the honor of being a guest speaker for my colleague’s class, a survey of British Literature until the 18th century. Dr. Dan Lochman had already introduced students to other Old English works such as The Wanderer and the poignant woman’s lyric, Wulf and Eadwacer. I was to start the discussion about Beowulf and then focus on the figure of Grendel’s Mother. I spoke in a large teaching theater to almost 200 students. I asked them to imagine its walls covered in gold. You men are thanes to Dr. Lochman, or Wulfdan; you women are wives in peace-keeping marriages. I am the scop singing to you [though fortunately, for the sake of your ears, I won’t really sing] about the inevitable destruction of this kingdom. First, I will sing to you the opening lines of Beowulf. You listen by drinking your ale or mead. The candles or seal oil lamps are flicking, light glinting from the golden roof. Here is the great interpreter/singer of Beowulf, Benjamin Bagby, performing the opening lines of Beowulf in Old English. That was god cyning. That was a good king. Hrothgar – or is it Wulfdan?– has been king for 12 years and during that time you men, his thanes, have been consumed; your blood has been drunk. Is he a god cyning? Then there’s Beowulf himself. He rules for 50 years. Yet, in killing the dragon and dying, he abandons his kingdom to invaders who will kill or send his people into exile. Is he a god cyning? Here is depicted an Anglo-Saxon king with his witan. 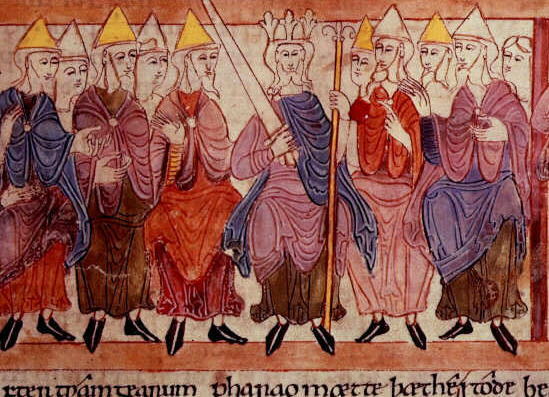 Biblical scene in the Illustrated Old English Hexateuch (11th century). Once upon a time people thought Beowulf was interesting in terms of folklore but lacked taste because of the presence of the monsters whom they found distasteful. But then someone had the revolutionary idea that the monsters were necessary to Beowulf. I’ll read to you what someone has written about Beowulf. That was writing by Tolkien in a famous 1936 lecture (later published) called The Monsters and the Critics. Tolkien revolutionized our understanding of Beowulf. He was the great Anglo-Saxon professor at Oxford in the 20th century. 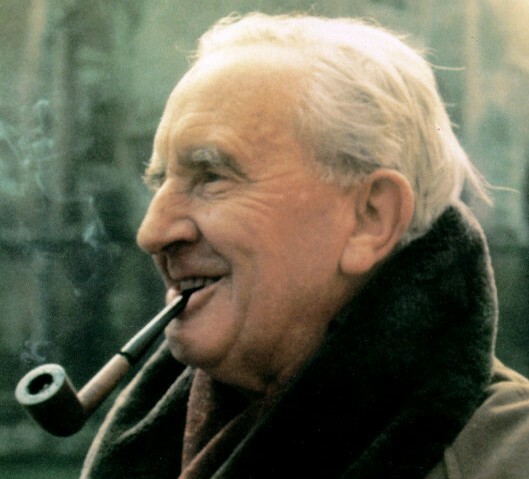 J. R. R. Tolkien with his characteristic pipe. I reminded the students of Tolkien’s connection to C. S. Lewis and the Inklings. 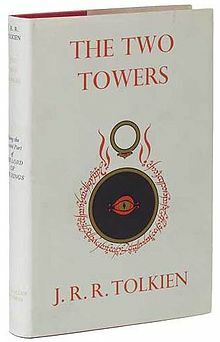 Tolkien was the first critic to draw attention to the poem as a poem and to point out that the central literary structure of the tale revolves around the hero’s battles with the monsters, which previous critics had dismissed as mere fabulous emendations to a tale whose primary value was historical. His writing is steeped in Old English, Norse, Icelandic, and Germanic mythology. If you read the Norse Poetic Edda about the pagan Germanic beliefs concerning the origins of gods and man, you’ll find that Tolkien stole, well, borrowed, a great deal. 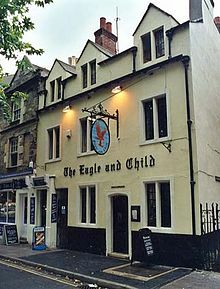 The Eagle and Child pub in Oxford where Tolkien, C. S. Lewis and other great thinkers would meet. I’ve had a pint or two myself there. “Where now are the horse and the rider? Where is the horn that was blowing? Here is the version as depicted in the film, The Two Towers. Rather than being uttered by Aragorn, it is spoken by Theoden. I’ll say more in a future post about what else I shared with my colleague’s wonderful students. Where are the blogposts of yesteryear?